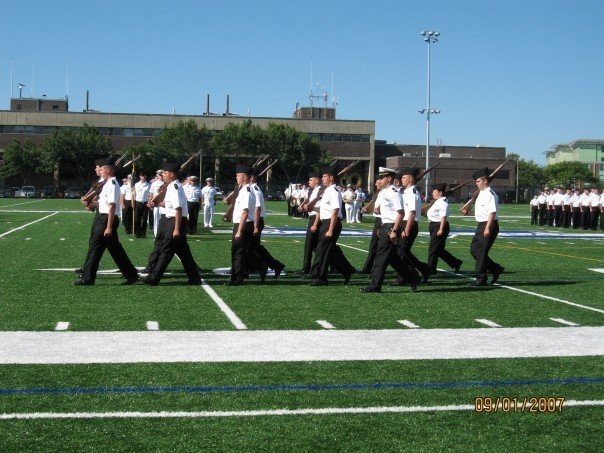 Incoming freshman to the Academy are called “cadet candidates” and keep that title until Recognition during the fall semester. When the cadet candidates first arrive for Orientation in mid-August they are expected to come with a freshly shaved head and face, wearing high white socks, gym shorts, a plain white shirt and white tennis shoes. I arrived at the Academy for my first day of Orientation escorted by my parents, who were beaming with pride. After milling about for a few hours and eating hot dogs and hamburgers supplied by the school’s food service we were all told to assemble at Alumni Gym parking lot. The parking spaces in front of the building were two men spoke; one was a Lieutenant, the man who planned the next two weeks of my life and the other was the Regimental Commander. As Regimental Commander he is the highest ranking cadet on campus, charged with making sure me and the rest of the Class of 2011 were ready for Mass Maritime. The two spoke about the next fourteen days and how afterward these cadet candidates will be changed men and women. Shortly after the Regimental Commander finished, the sound of a beating drum was heard and soon a platoon of all the Orientation staff, the Cadre, was marching up to the building. It seemed as if the whole crowd fell silent as the platoon leader gave the command to “halt” followed by a “left face”. The platoon raised their right hands as the RC then proceeded to “swear in” the Cadre. For me it was my first first-hand experience of marching and it would certainly not be my last. During the two weeks of Orientation the word ship is bred into our brains. The Cadre tell us that the men and women around us are our shipmates, we will succeed as a unit or fail as a unit. Our large group of cadet candidates is divided into six different companies, 1st through 6th, each with their own leadership. Each company has a Company Officer, an Academy employee, a Company Commander, Executive Officer, Training and Retention Officer (TRO), 03 Deck Platoon Leader, all seniors, and five Squad Leaders, all juniors. There are other positions but these are the only ones freshman interact with during Orientation. 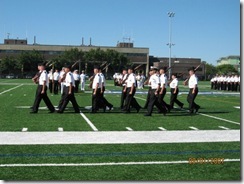 Squad leaders are with the cadet candidates all the time unless the leave them in a class. There is also a Regimental Staff all seniors that include: the Regimental Commander, Executive Officer, Chief Operation Officer, Regimental TRO, Regimental Adjutant, Cadet Chief Mate, Cadet Chief Engineer, Student Government President, 1st Class President, and an Operations Officer for each major. We received our “chafing gear” on the first day when we checked in, it’s a small pamphlet with knowledge we should have already memorized printed on its pages. Some of this knowledge is the name of every senior who has a rank I listed above, if their name isn’t in the book we write it in. Everyday we wake up before the sunrise and wait to go outside until every shipmate is awake and wearing the same thing.� They also tell us that right now we are the lowest of the low at the Academy, we are not yet cadets only cadet candidates. We must walk with our pinky fingers along the wall, must carry our chafing gear at all times, and cannot use the phrases I, me or my only referring to ourselves as cadet candidates. Each company takes part in physical training in the morning followed by lectures, meals, and hands on experience throughout the day. If any of our shipmates fall asleep during a lecture or forgets their chafing gear we all do pushups, even the Cadre. I took two things from the mistakes I just mentioned; one is that no matter what the speaker is talking about they deserve our respect and attention, don’t fall asleep and two that carry the things they tell you to, its called being responsible. We learned to look out for each other maybe not for the right reasons but we started to understand the whole shipmates idea. If one of us screwed up we all paid the price, no longer were we looking out for only ourselves. The last topic I’ll hit in this post is respecting those leading us. They understand the hardships, the fatigue, and the constant yelling. The cadre who drove us through Orientation did the same exact thing two or three years ago. Even if we think they are poor leaders we should respect them. They survived their first few years of Maritime and now they are given the opportunity to lead others through it with the experiences they’ve had themselves. The people who put them in their position believed that these Cadre will help produce another class of successful cadets and pass on the traditions of the Academy. Tagged with Logs of a Student Leader.